Counting down the days until Sharon gets back (two!) from the world's largest land-locked country. Haven't heard from her in the last 24 hours, but I believe this is the day she's staying in a "Soviet-style Sanatorium" (their words), so perhaps she's enjoying the facilities too much. 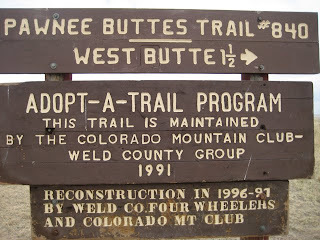 Today's entry comes to us from Connie Kogler of Birds O' the Morning, and involves a long hike through some love bits of Colorado. What's the first thing that comes to mind when you think "Colorado?" Curvy mountain roads? Great ski runs? 14,000 foot mountains? Prairie? Prairie?! Yes, nearly half our amazing state is prairie grasslands and it holds many secrets. My sister Lauren Burke from Broomfield and I went out for a day of discovering a few. 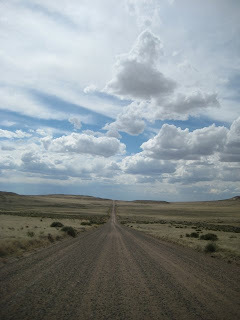 No long and winding roads here, only long.. .. and straight. 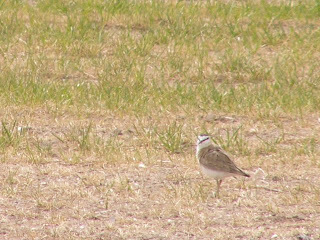 We discovered this lovely Mountain Plover while flying along a road like the one above at 55 mph. Had to stop and back up. Kind of amazing we actually spotted it. There was a second one too and both were nearly invisible. 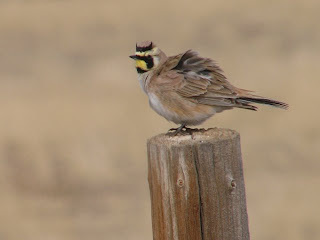 Horned Larks were everywhere and thankfully one stayed still long enough to get a few shots of it. Very cool little birds. Note the spiffy little horns, this dude seemed especially proud of. We stopped at the Crow Valley Campground, a well known hotspot for birds. And we found something cool! 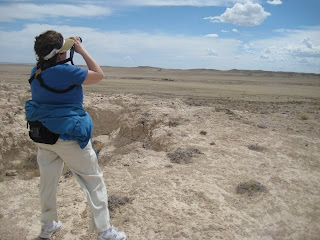 (Hard to do living amongst all these fantastic birders on the Front Range!) An adult female VERMILION FLYCATCHER. 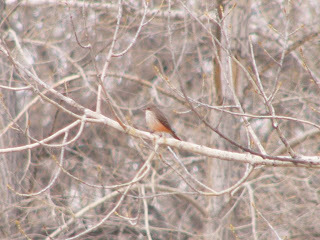 My first great look at this bird. I've only once before seen one, a male, and then only from a car that would not stop. We spent about 20 minutes following her around and taking pictures and even stopped back later in the afternoon on our way home to see her again. She's quite out of her range here in Colorado.. and with the storm we're having she'll wish she was back in Rick Wright's yard in AZ. A lifer for Lauren and a state bird for me. 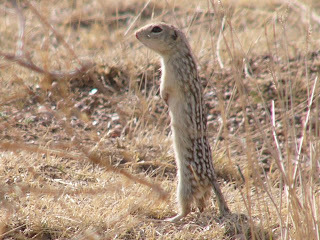 I believe this little guy is a 13-lined Ground Squirrel, though how it sat still long enough for anyone to count them is beyond me! So cute though. Heading down the trail.. This is a bit of the face of a rock near the Pawnee Buttes. 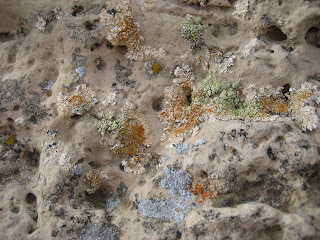 Amazing colors of lichens! I'll bet someone knows the names and types of these? 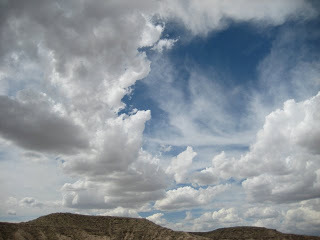 On the way back from hiking 1.5 miles out to the west Butte the sky was amazing. I took one shot that you need a magnifying glass to verify, but it has a hawk in it! 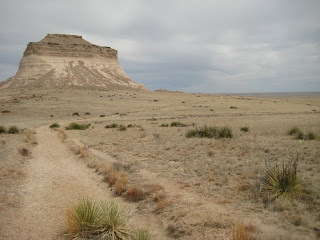 (not this one) Here is our first view of the Pawnee Buttes. Yes, there's two. The second one is behind the first. 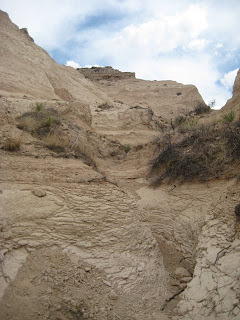 There were some crazy side canyons off of the wash we scrambled down. Not someplace to be during a flash flood! 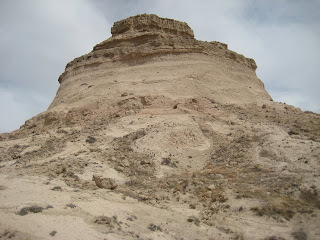 The second butte! See I told you.. Lauren wondering how far we're going to have to walk back to the car.